Sourcing the best fishing reels is something of a challenge in the modern internet age. And yet it is one of the most important acts a budding fisherman can take when putting together his fishing gear. The right reel is essential to ensure a good days fishing. Whether you are fishing for salmon, swordfish or snapper there are quite a few options out there. Making the right choice can certainly be daunting, if this is your first forray into the world of fishing reels. The fishing reel is, at first sight, a complicated piece of kit and wading through all the marketing garbage online can wear you down. That being said, here at Go Get a Fish, we have accumulated a great deal of knowledge and experience over the years and we feel confident in recommending our best fishing reels. Those that made our list have been selected on their performance across a number of key characteristics. But before we get to our recommended best fishing reels, allow us to give you, the novice angler, a brief background as to fishing reels. Ask a fishing historian and he will tell you that the fishing reel was invented in the Song Dynasty by the plucky Chinese. They were quite the inventive bunch back then (less so now) and the earliest depiction of a fishing reel can be seen in the painting Angler on a Wintry Lake by Ma Yuan from around 1195 AD. The English later got in on the act in 1650 AD and subsequently fishing reels started to appear in London shops by the 1760s. Then the Americans got involved in the reel business in 1820 and from there fishing reels really took off in popularity. Over the years many reels mutated and developed bringing us to the modern day array of reels. Spend ten minutes looking at fishing reels on amazon and you will either give up or begin to notice that reels are often subcatagorised into the following styles. It is worth understanding these different reels as each have particular uses and are tailored to different conditions and different level of experience. The spincaster reel is the basic reel for kids and beginner anglers. It is super inexpensive and incredibly easy to get to grips with. It has decent casting accuracy and is easy to untangle. However is does have its disadvantages. It can’t really be used when hunting big game fish and they are also not very suitable to cast very far. Most people use this reel to learn the basics and then quickly move onto something more substantial. The spinning reel is probably the most iconic of the fishing reels and very good for beginner and seasoned anglers alike. It is a very easy reel to learn how to use and, once mastered, is very versatile. The bail for the reel spins as your line is being retrieved, hence the name. These types of reels are very affordable and you may want to jump straight past the spincast and start out with this type of reel. Centerpins reels are designed mainly to feature a large diameter spool which is free to rotate round a central pin, hence the name. Such a reel is designed for longer casts. So the baitcasting reel is very popular for more experienced anglers. During the release it ensures there is not line twist and it can also help to produce greater power for more distance when casting. The baitcaster gives more control and accuracy and is pretty good for big game fishing with heavier lines. A disadvantage is that it will require more practice and skill to master, but that is all part of the fun of fishing. Trolling reels are mainly used for deep sea and offshore fishing. Designed to handle big game fish from the depths of the sea these reels have their uses for anglers targeting those species. However, in my native South Africa we call them “multipliers” and they are very popular amongst rock and surf anglers as well. Fly fishing reels are designed with precision in mind. When fly fishing, you need to have accuracy in order to cast the line to your desired spot, so fly fishing reels offer some of the most accurate casting you can find. As with most pieces of technical fishing equipment there are a number of brands jousting for space in the market. Each has their own history and are known for specialising in one or more the above types of reel. In truth there are too many brands to mention, but in our opinion it is worth looking into the following. There are many, many more fishing reel brands worth looking at and by no means should you limit yourself to the above list. That being said, if you are new to fishing then you have to start somewhere and this list is as good a place to start as any. These are the types of reels we are most familiar with and are comfortable making recommendation for. We have looked at and used a multitude of reels over the years here are our best picks for each category. After much consideration we decided to go with the Pflueger President Spincast Fishing Reel. It has a very tough build quality, the bearings run smooth and it casts incredibly well. A spincast is often touted as a reel for beginners, however this reel performs like a truly professional piece of kit. We have recommended this reel to a few friends and they along with us are very happy with it. A friend of ours gave this reel to his son and they have been out fishing every weekend for the last month, check out the price here. We went back and forth on a few choice here but in the end it just had to be the Shimano Stradic Ci4+ 2500 FB HG Spinning Reel. Shimano makes truly excellent reels. It has a super smooth and strong drag, you can cast it incredibly far and it has performed very well in some pretty extreme conditions lately. It might be a bit pricey, but you certainly get unrivalled bang for your buck. If you are interested you can see the price here. Settling on a baitcaster reel proves to be pretty tricky. There is so much choice out there, but, in the end, we went for the Abu Garcia Revo MG Xtreme Low Profile Reel. We have tried many of the big name baitcasting brands and this comes out on top. You can cast quite an impressive distance, it is very accurate and it is extremely lightweight. This piece of kit is also incredibly smooth with a 8.0.1 gear ratio. If you want to be impressed (and to impress) then you can find out the price here. Trolling reels have to be able to handle terrible conditions. You really need something tough. We tried a few over the years but none can compare to the Penn Squall Lever Drag 2-Speed Trolling Fishing Reel. This is one hell of a piece of kit. You can drift between high and low gears, the operations are incredibly smooth and it wont let you down in a fight to the death. We took it out only last week and it performed without a hitch, check out the price here. Fly fishing is something of an art form in our eyes, but even the best artists have to rely on their tools to a certain extent. I’ve spent over 15 years fly fishing and few reels come close to the Orvis Mirage USA Fly Reel. It is both strong and lightweight, built to handle some monster fish as well as challenging salt water conditions. I wouldn’t head out fly fishing with anything else these days, check out how much this costs here. 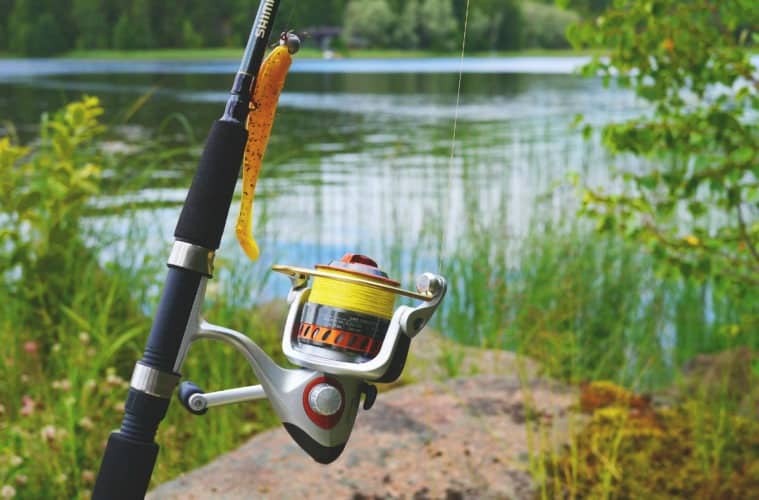 Before you head out to purchase a fishing reel there are a number of useful tips on fishing reels you might want to read up on in preparation. First of all you should decide which type of reel you are interested in. Is it a closed face, free spool, centre-pin or fixed spool reel. Do some reading beforehand or chat to some experienced angler if you are in doubt. Both multipliers as well as fixed spool reels are fitted with a drag system. In fixed spool reels you get both a drag on the front on the reel (front drag reel) as well as on the rear (rear drag reels). They may differ in location, but they have the same function which is to tighten or loosen the movement of the spool. With a loose drag the spool will rotate easily and any hooked fish will be able to pull line from the reel with ease. On the other hand, when the drag is set tight the spool will not be able to turn that easily making it much more difficult for the fish to gain any line. If the drag is set on its tightest any sudden movement of the fish at the other end of the line will snap the line like a piece of cotton. Therefore, while you are busy battling a hooked fish, it is essential to apply constant pressure on the line by keeping your rod upright and continue reeling in. This is where the drag on your fishing reel comes into play. The drag allows you to keep on reeling during the fight ensuring constant pressure. Again, this boils down to personal choice. Nowadays most spinning reels give you the option to move the handle either to the right or the left. The retrieve ratio of a reel tells you the speed at which line is retrieved and is quite an important piece of information. Fixed spool reels generally have a retrieve ratio of around 5.2:1 which is quite a high ratio. When fishing on the shallow reefs of False Bay this ratio is very important in order to avoid being snagged on submerged rocks and vegetation once you start reeling in. General fishing reels will have a retrieve ratio of between 4.8:1 and 5.4:1. Big powerful reels that are built for battling brutes of the deep blue have a much slower ratio which assist the angler in pacifying strong adversaries. How much should I pay for a good quality reel? When it comes to price you have to pay for a decent reel, the permutations are legion. With the variety and different brands that are available in the market today, the question of making a choice can be quite daunting, even bewildering. Eventually it will come down to personal choice, but, I would recommend a base figure of $100 in order to ensure that you buy a quality product which are pretty much guaranteed to provide you with high performance service for many years to come. In order to ensure its durability and effectiveness it is very important to properly clean and maintain your reel. First and foremost, don’t give your fishing gear a blast of high pressure water from a garden hose after returning from a fishing trip. This is a common mistake made by quite a few anglers which can really damage your equipment in the long run. Saltwater is probably enemy number one of a fishing reel followed closely by dirt and sand. That’s why saltwater anglers need to clean their equipment, especially the reels, after every fishing trip compared to freshwater anglers who can get away with a thorough cleaning session every week, month or so. What are the best ways to clean a reel? After each fishing trip you can take warm, soapy water and, using a sponge or cloth, wipe the reel as well as the fishing line thoroughly. When this is done you can rinse your equipment off with fresh water. Again, stay away from using a high pressure blast of water at all times! When cleaning a fixed spool reel with a front drag you undo the drag knob, remove the spool and clean its underside. You can also grease the main shaft before replacing the spool drag knob and spool. Make sure you use a high-grade reel oil for lightly oiling the handle knobs, bail arm springs, line rollers, folding handle. Any excess should be wiped off. Remember, less is sometimes more when it comes to applying oil to outside parts. How do I protect my reel when the line get stuck underwater? One of the common mistakes made by novice anglers which I have witnessed through the years occurs when their line gets stuck under water. First they try to snap off the line by performing a series of quick jerks with the rod. When that doesn’t work, they either start walking backwards until the line snaps or wind the line a couple of times around the handle of the reel before doing the same. Big mistake, because the tension applied by this action can put the sensitive parts of the reel under immense pressure. Rather take a metre or so length of line, wind it a couple of times around your arm, thereby taking the pressure off your delicate equipment, and then proceed by snapping the line. How do I cast with a trolling reel (multiplier reel)? As I’ve mentioned above, these type of free spool reels are very popular amongst the South African rock and surf fishing community because of their robust nature, dependability and ability to withstand the corrosiveness of salt water and sand. They are also sturdy enough to take quite vicious bangs against rocks if you are into a bit of extreme fishing. But, this is also a type of reel that needs a modicum of skill to handle, because they are notorious for the overwind or “bird’s nest” which means a mass of tangled lines if you get the cast wrong. To avoid that you first have to find a balance between your terminal tackle (baited hook and sinker) and your drag system. Make sure your drag is not set too loose while casting, because that will result in line stripping off your spool much faster than the actual line speed of your terminal tackle ending up in that dreaded overwind. Also, while casting, put your thumb lightly on either the spool of your reel or the line to add further drag, thereby ensuring a smooth release of line. Fishing reels are truly awesome pieces of equipment and as you have read they come in all sorts of shapes and sizes with differing brands catering to different uses. I hope we have gone some way in explaining the basics to any potential new anglers out there. I hope you found much of that useful. If you have any thoughts to add to the conversation then please feel free to comment below. Dear Johan – I am happy with my Finnor 80. Will be using it in Henties Bay in March this year. Hope to send you pictures.